Georgia Dalmatian Rescue View other Dalmatians for adoption. 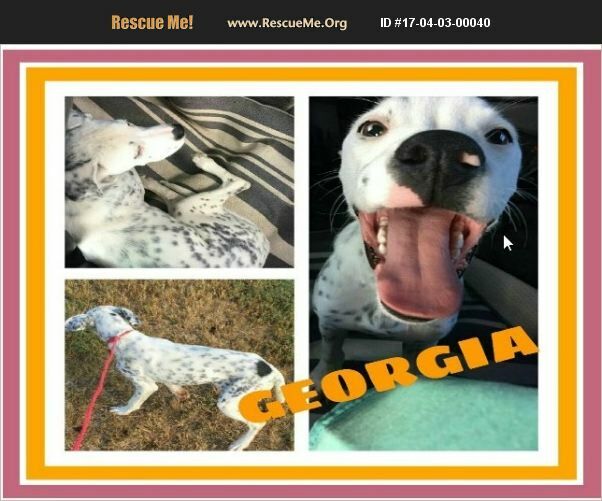 Georgia is a lovely, very young Dalmatian mix puppy. She loves to cuddle, play, run and give and get kisses. Georgia was being fed by a family who moved away and asked their neighbor to feed her. When Georgia refused to eat, she was brought to the shelter to be cared for. Now in a foster home with toung boys 3.5 yrs to 16 + several dogs, Georgia is in her element, overcoming fear of abandonment and really blossoming! Georgia has a unique + strong personality. She loves sticks... She will run into the yard, find a stick, and run up to show you but dash away the minute she gets too close. And squirrels.... She has tried to climb a tree to catch those pesky animals. She runs from one end of the yard to the other, following her nose. She is very playful and loves to be cuddled. Very energetic, as are most puppies but eager to learn. She is not a very large girl (weighing in at only 23#), so will fit just about anywhere! She has lots of growing to do yet, and lots of learning. Won't you be her teacher and show her that not all people leave little girls behind! For more information contact Sandy at sandy@ksold.com.